Push the lock tab forward or push the master door lock switch in the lock direction , and close the door. Push the lock tab forward and close the door. 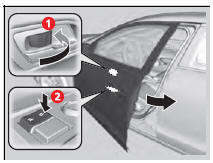 The doors cannot be locked when the keyless access remote is inside the vehicle, and any door is open. When you lock the driver's door, all the other doors lock at the same time. Make sure you have the key in your hand before locking the door to prevent it from being locked in the vehicle.